WayForward, those tireless keepers of gaming’s old guard, unveiled its latest project at the beginning of April. Double Dragon Neon follows in the footsteps of the company’s work on titles like Contra 4 and A Boy and His Blob, a winking, modern take on a 1980s classic. Those games however were crafted with hand drawn two-dimensional graphics and their celebrations of the past were little more than subtle nods. This take on Technos’ long lost beat ‘em up series is quite a shift away from that ethos, an online multiplayer game with grimy polygonal 3D graphics and a brazenly satirical take on the ‘80s. Digital Trends caught up with WayForward to talk about Neon’s stylistic differences from its usual output, the studio’s relationship with Majesco, and the game’s creative roots. Publisher Majesco trusts WayForward to make the best game possible as well. It was the publisher that approached WayForward with the license. “We are lucky enough to have a great relationship with Majesco, who approached us with the opportunity. We decided to bring the Neon, and we’ve been working tirelessly ever since.” Majesco published both WayForward’s A Boy and His Blob and its first HD 2D sidescroller Bloodrayne: Betrayal. 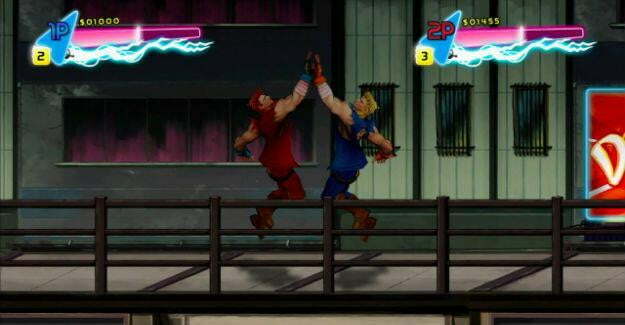 Double Dragon Neon will be available on Xbox 360 and PlayStation 3 via Xbox Live Arcade and the PlayStation Network this summer.